First we were going to go fishing. Then, we weren’t. 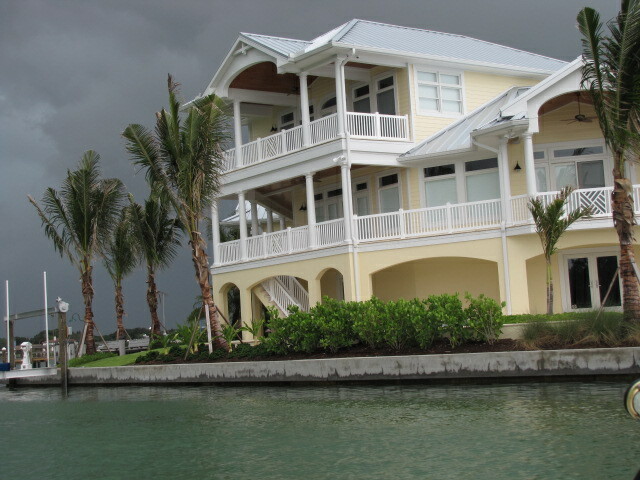 The weather didn’t look great out in the Gulf, but it looked decent here at the house. Storms materialize out over the water and then move inward and vice versa. We waited for a bit. I walked to the beach to find a bunch of nasty stuff. I like fishing, but we also fish responsibly. Someone had fished last night on the beach and chucked all of their fish carcasses for beach goers to enjoy this morning. 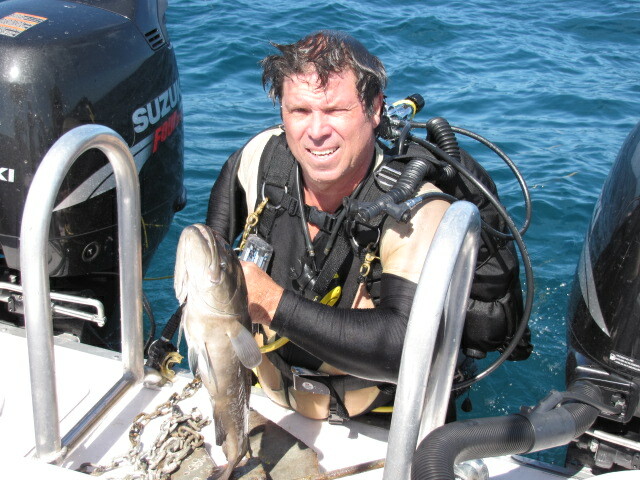 I saw a huge Grouper head, two Stingrays missing their tails and some other stuff that had been picked apart by birds. I walked home, the stench was awful and the sight disheartening. 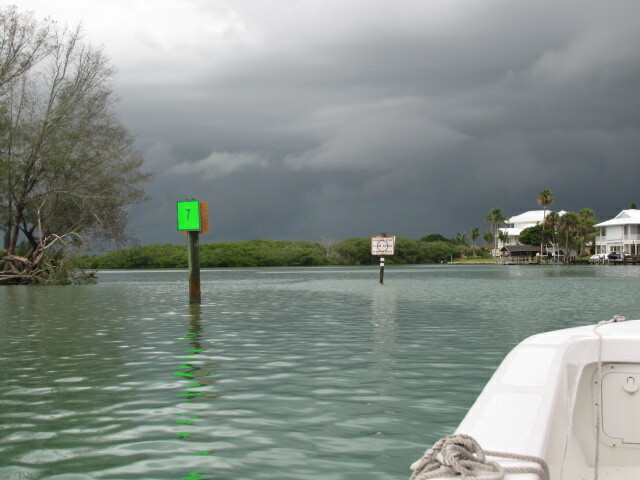 The guys had returned from purchasing their fishing license, and we checked the weather once again. We loaded the boat and left. 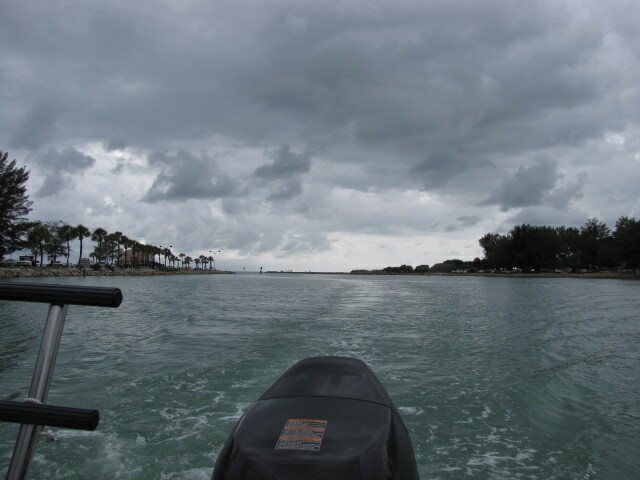 We headed out in the Intracoastal to Venice and entered the Gulf through the jetties there. It’s a really scenic boat ride. We went out eleven miles. From that distance, the shoreline is hard to make out. The water wasn’t really rough, no white caps, but the swells were large. I didn’t fish much at all. I manned the sandwiches, the sunscreen and the beverages and enjoyed the sunshine. 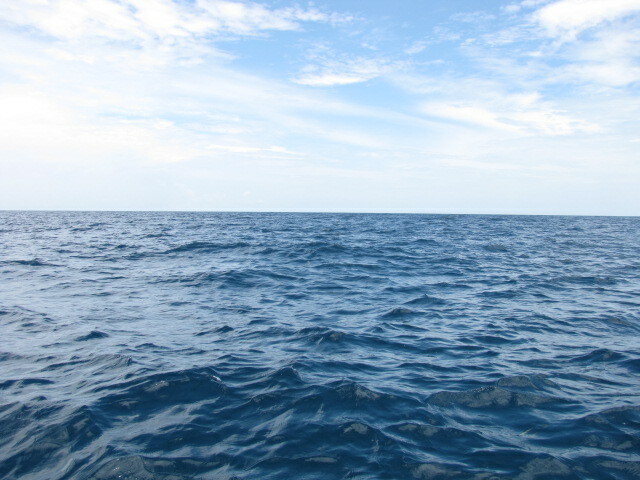 It was hard to maneuver around in the boat with the big waves, but we did it for awhile. We didn’t boat any fish, but Frank and Bob both had a nice one on at one time. Check out the end of Frank’s pole. He just barely got his line on the bottom and something hit it. He was using way too small of a pole for the fish that latched on. He hung out with this bent rod (and passed it around to all of us) for awhile. 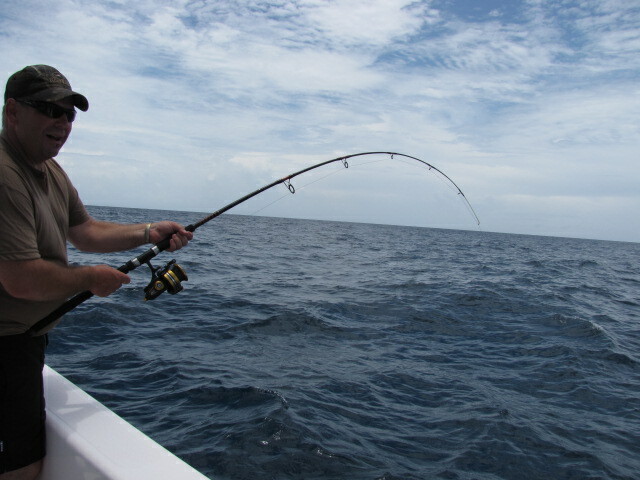 Bob dropped down an entire bait fish on his huge pole next thing. He had something on it right away. It got off, but when he reeled in, the bait was pretty much mangled and the huge circle hook he had on was bent. Unbelieveable. We think Frank had a giant Grouper on, they don’t fight, they just hang out. They’re sort of like bringing up a car hood. Bob may’ve had a big Shark. Definitely something with powerful jaws for sure. The sky started looking kind of scary. This is when you’re not sure if you should stay out in the Gulf, or head to shore. We usually think closer to home is better, we were starting to see some lightning. As I mentioned earlier, this is a real scenic boat ride. 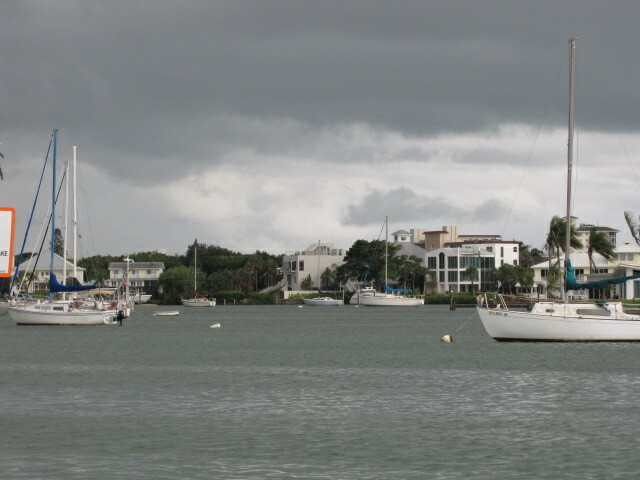 Lots of beautiful homes and sail boats are anchored in this area. It’s also home to a real good seafood eatery called the Crow’s Nest. Check out my new house and boat. There’s room for each and every one of you that read this blog, so let me know if you’re interested in visiting me. The yoga teaching business is really good. Right about now, the rain started to hit. It was painful. Not just because we had to cut our outing short, but because it stung like hell when we were going fast. Halfway back on the intracoastal, we decided to stop and park at the boat ramp by a school there in Venice. There was some shelter there, but the wind was blowing and we were soaked anyways, so what in the hell did it matter? We did get in the water there. Why? Because it was warm. After wasting some time, the rain didn’t let up, so we headed out. Just passed the marina there in Venice, one boat engine quit. Then the other one too. Uh oh. Does anyone have their cell phone? Whhaat? Four people with 5 cell phones between them and no one thought to toss one on the boat. What in the hell were we thinking? We floated around in the intracoastal and didn’t see a soul. I mean really, who would be out in this crap? Us, that’s who. After some messing around with the boat engines, one started up. ONE. That meant we could move, but not really fast. That was fine with me, I was tired of being pelted by the stinging rain. Did I mention that it takes about 45 minutes (when you’re going fast) to get out into the Gulf? It took twice as long to get in. I’ve never been so happy to see the bridge at Englewood in my whole life. We were freezing, literally freezing. It’s amazing how cold you can get in the wind and the rain when the temperature outside is still rather balmy. We made it home. We jumped in the solar heated pool here at the house and it felt like a hot tub. We ate diner and then I headed out to the camper alone and took a 2 hour nap. Maybe we’ll try boating again tomorrow, who knows? For now, we’re safe, warm and dry. And I’m still on vacation and that’s a good thing. 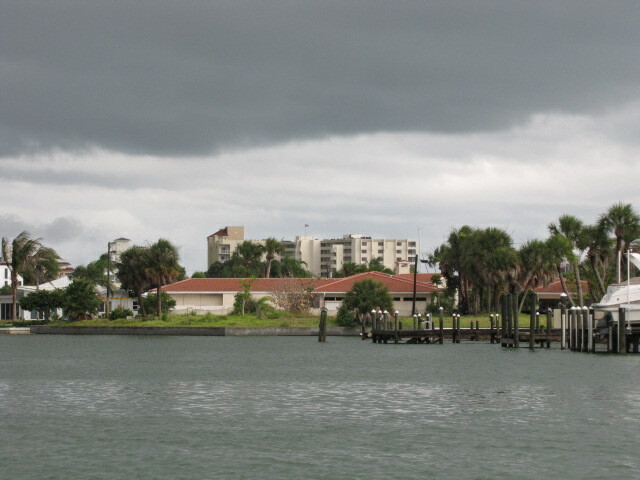 Categories: family, fishing, travel | Tags: boating, fishing, florida, Gulf, venice | Permalink. Today, we were up fairly early. My dad, his dive buddy Scott and myself were at the boat dock by 8:30 a.m. Lucky for us, the boat dock is just minutes from the house. 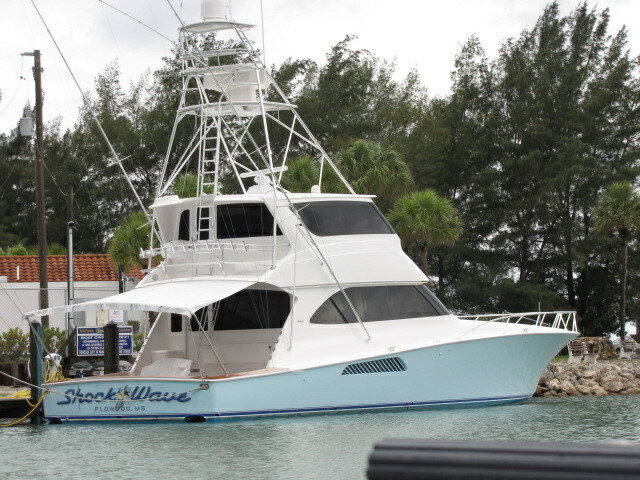 My dad has a 27 foot Twin Vee Catamaran and it’s a pretty decent boat to take out into the Gulf. We only headed out 3 or 4 miles this time. They’d already staked out a place for diving, a place where there are several concrete culverts that are homes to lots of fish. It was a great day for diving, but not such a great day for pole fishing. I didn’t catch a thing. My dad caught several. I think that spearfishing is somewhat unfair, but I’m sure I’ll let that slide as soon as we finish dinner. 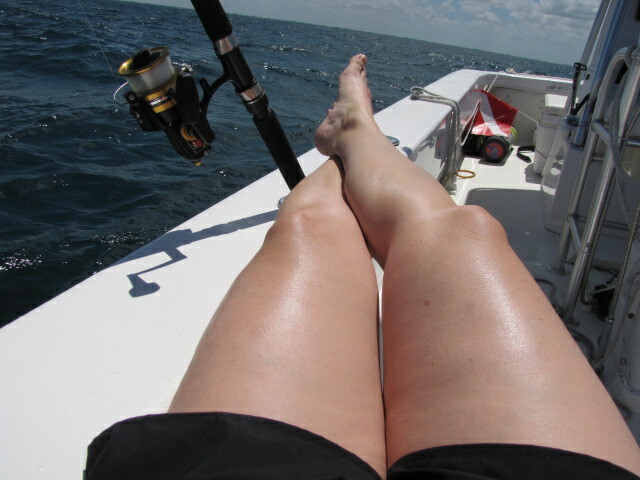 We boated 1 Grouper, 4 Red Snappers and 2 Triggerfish. 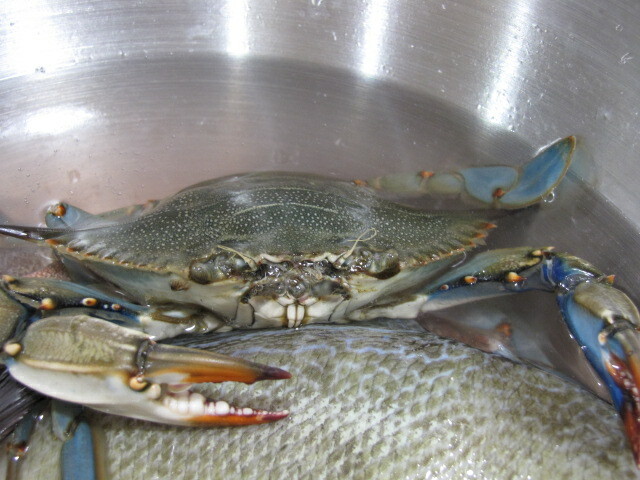 Oh and we got one Blue Crab too. All are excellent eating. 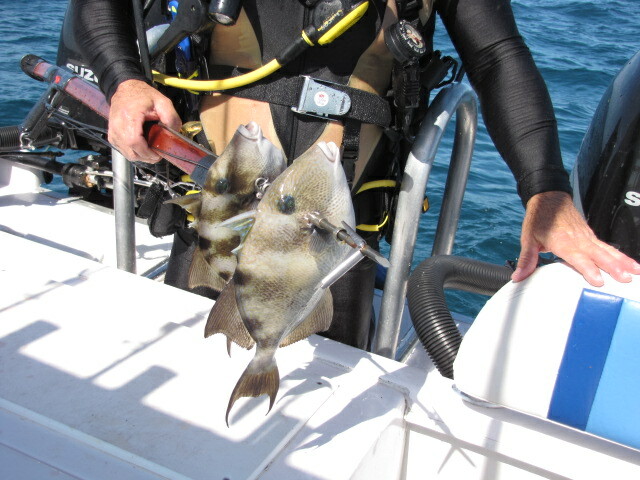 Triggerfish, good eating for sure! My dad Bob. Grouper, awesome eating for sure! Scott and Bob bringing the boat in. Blue crab. He was floating on the surface. It’s awful nice to know that I have like 26 more days or so to get those white legs of mine nice and tan! 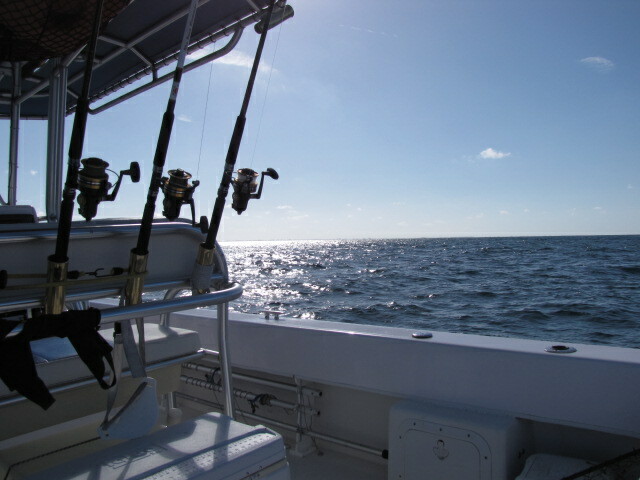 Categories: fishing, travel | Tags: englewood, fishing, florida, grouper, Gulf, red, snapper, triggerfish | Permalink. We’ve been experiencing unusually odd temps for July in our area here lately. Bright, clear blue skies, no humidity and low 80’s during the day and low 60’s in the evenings. I’m enjoying the windows open, and frankly, so are the cats. Yesterday morning I led a yoga birthday party at the studio. What a great idea for a 14 year old. She showed with her mom and 7 girlfriends. None of the girls had ever taken a yoga class so it was a real eye opener for them. The birthday girl left the studio with a free eye pillow and a Tees For Change tank top. I had so much fun doing this. Here’s a snapshot of our fun group. I hope I turned a few of them on to yoga. Perhaps I’ll see them again at our studio, or at another. The main idea here was to get them interested no matter where they choose to practice. I think they left wanting more. As soon as I got home Frank had the boat loaded and ready to go. This would be my second time to hit the water this week. We went to Stockton on Thursday and were on the water approximately 20 minutes when a gigantic storm materialized out of nowhere putting us in blinding rain, wind and thunder. Needless to say we caught 16 crappie quick-like before we pulled the boat out of the water and headed home. All in all that wasn’t a total wasted trip as we got a nice catch. Yesterday we didn’t catch any fish that were worth keeping, but we did enjoy the beautiful sunshine, cooler temps and blue sky. The water was smooth and the boats were minimal. Actually there were around 12 trucks at the boat launch this time, the most I’ve ever seen at Stockton. But it was a Saturday. On Mondays when we go we rarely see another boat on the water. I don’t care if I ever go to Table Rock again. We spent a couple of hours in a nice little cove where I floated on an air mattress and looked for fossils. Here’s a sampling of what I found. I like to press my clay into some of these fossils, then pull it out to see them in a different view. I found these at the High Point area of the lake. Today the weather is lovely once again, but this will be a work around here day. I leave for Florida on Tuesday and I’ve been working on getting our daughter’s room in order. It’s a disaster area. I’m pulling her door off today and taking it outside and painting a chalkboard on the front. She’d wanted one painted on her wall, like in our kitchen, but her room is full of windows, doors and a built-in desk (which I wanted to paint white while she was away) made of knotty pine. It’s pretty wood, but it also makes for a dark alcove in a blue room with white trim. Our son’s entire room is knotty pine. He loves it, very cave-like. Update – I finished Lauren’s door! Categories: fishing, Yoga | Tags: crappie, fishing, fossils, lake, missouri, springfield, stockton, Yoga | Permalink. On Wednesday, June 17th to be exact, our daughter left with my parents for a cross country journey in a camper. They left our place here in Missouri, even though they’d had some minor trouble with their big diesel truck. They did make it to their destination in Sundance, Wyoming to my aunt’s place, so that was a good deal. Once there though, the truck bit it. They were stuck. I made jokes with them about how awful it must be to be stuck there of all places, and to be retired, and not have to worry about getting home any time soon. They even have both of their cats with them! They’d planned on staying only a few days. They’re still there. And it’s Saturday, June 27th to be exact. The truck is now fixed to the tune of $2,300 but they can get on the road again. They’ll have to cut their trip short and skip out on Minnesota as they want to be back in Florida for the 4th of July. Lauren is having a wonderful time. I’ve only talked to her on the phone twice since she’s been gone! She’s sent a couple of e-mails, if you can call them that. They’re basically one liners. I’m glad she’s not homesick. She’s been traveling since she was born, so it’s nothing new to her. I’d much rather have her be independent than whining to come home!. She’s seen Mt. Rushmore , the Devils Tower and the Buffalo Jump, and she’s only 11. These are places I’ve never seen. She’s found tons of cool fossils, arrowheads and buffalo bones. She’s been busy baking bread with my Aunt Kathy and doing who knows what other cool things. Kathy’s crafy-cool like that, in all ways. I miss Lauren, but I’m also staying really focused and accomplishing a lot of things that I’ve wanted to get done. I’ve also had time to dive into a great book my mom left me to read. It’s called The Ice Maiden. I can’t put it down. It’s my kind of stuff. The day after they left I took Jordan job hunting. We headed to the pretzel place at the Mall, and they hired him that day! Unheard of. Our minds were blown. We had a huge list of places to go and apply. He started the next day, and he really likes it. He’s also been busy with a friend that’s a girl, so I’ve been doing some extra driving to her place, to the movies, etc. Soon though, he can license and insure his truck, ditch the driver’s permit and get the real license. Then he can get himself to all of the places he needs to go. We spent a great day at Stockton Lake on Monday. It was super hot and we were the only boat on that lake. We usually are. I guess every one has to go to Table Rock and be seen or whatever. We quit going there. Too much traffic. It’s just not fun. We beached the boat on a pea gravel beach and just swam and played all day. The fish really hit the water on that lake and it always scares the crap out of me. There I am, floating in a blissful state on my raft and out of nowhere, comes a huge splash. Frank caught a bass that was almost 8 lbs. so that was really exciting. I found some really nice fossils on the beach, but no arrowheads. I also got really sunburned. I always forget. Reapply the sunscreen every two hours or put on a shirt! You could’ve probably fried an egg on my back the next day. But I still taught yoga the rest of the week, though wearing the sports bra was no fun. Hope your summer is off to a great start. I’m ready for it to cool down a little bit! Categories: family | Tags: fishing, fossils, lake, stockton, sundance, wyoming | Permalink. My husband, can do about anything. He used to be an electrician, so that has come in WAY handy with the kitchen. He put in extra outlets, installed under the cabinet halogen lamps and soon, new track lighting on the ceiling. He can also do plumbing, as he unclogged the bathroom sink Thursday night. Not to mention the one time, I put wheatberries down the garbage disposal (not recommended) by the way. That took like 6 hours of snaking and I’m not kidding! He’s very mechanical and it does save us a lot of money. I do pay to get the oil changed in my car (it’s the disposal thing) but he does the brakes and once patched the screw hole in my tire! He changes the filters and the belts. He also works on boats and motorcycles and anything else with an engine. He just put like 4 riding mowers together and built one good one for his dad. One time, there was a push mower out by the road, left for trash a few houses up. He took it home, fixed it, then took it back and set it inside their fence with a note that said “fixed” on it! He does stuff like this a lot! He’s a nice guy. It takes us a long time to get things completed. One reason, is we do it ourselves. The other is, while he’s working on our stuff, he’s also working on someone elses! He also rebuilds and repairs computers. I wouldn’t have a laptop if it wasn’t for the three broken ones that people gave us for parts. He put them together into one, just for me! He can also do the software thing, not just the hardware. He helped me get started with my web site stuff and my group email. I think the only time we’ve hired help around here, is when we got our roof, our windows, siding and had the driveway poured. But, those were all done by close friends. He knows every body, I’m not kidding! The only thing I’ve ever seen him give up on, was when I accidentally washed our sons’ iPod Shuffle. He actually got it to power up, but it would no longer connect to the computer. Amazing! Before anything gets thrown away, it gets completely taken apart and examined. We clash sometimes, as I’m into throwing stuff away, and throwing it away right now! He’s spontaneous and I’m not. In the middle of something, he can drop it…….and just “go fishing”. I have a hard time doing that, I need a plan. But I guess that’s why I take and teach yoga. I need it to remind myself that it’s “ok to just drop it and go fishing,” or whatever. One time, in a group of people, the discussion turned to the secrets of a happy marriage. Someone replied, “Marry a happy person.” I totally believe that’s true! Frank Fishing August 2008 You Rock Honey! 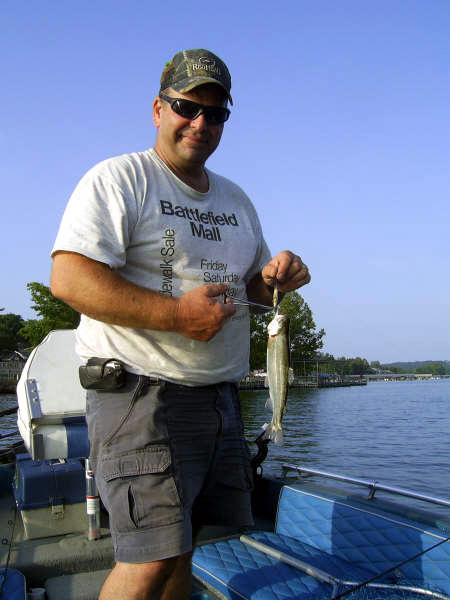 Categories: Projects | Tags: electrician, engine, fishing, mowers, repair, Yoga | Permalink. I skipped out on teaching my yoga class yesterday morning. It was a holiday weekend, so lots of people are doing other things, like being out of town. We had no kids at our house this weekend, so my husband and I loaded up the boat and headed out to Lake Taneycomo. It really reminds me of a wide river, not a lake. And since the water is from the bottom of Table Rock Lake, it’s really cold. Like 55 degrees cold. Which means, when you get hot, you can’t jump in and swim. But, you can go fast in your boat and freeze to death! We had a great day with a haul of 18 trout. You are only allowed to keep 8. So we did. We grilled them for dinner, they were awesome! Later, we made black raspberry jelly from the berries picked from our yard. We now have like 16 jars. I just learned how to make it. It’s actually really easy and doesn’t take that much time. Just when you thought the day couldn’t get any better, I heard music flowing from our garage at 10 p.m. My husband plays some music and the guy next door is in a band. He brought his dobro over and my husband was playing his guitar. What a totally busy in a wonderful way kind of day! My life used to be busy, but it wasn’t what you would call full. Yesterday was busy and full. Doesn’t get any better than that! 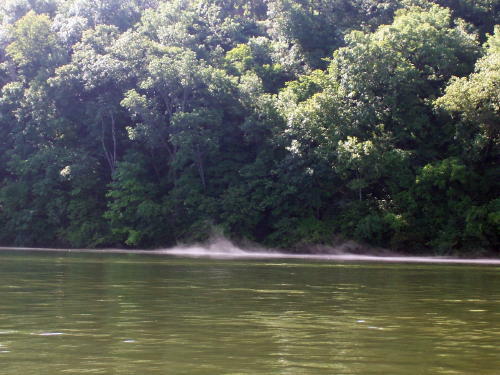 Categories: fishing | Tags: Add new tag, dobro, fishing, jelly, lake, music, rock, table, taneycomo, trout | Permalink. It rained. All day long. We are going to float away here. I feel for the people who have basements. We don’t have one. I did a little shopping for a birthday gift. Ended up at one of my favorite new age bookstores. The place is awesome, as they have new and used books. They have all sorts of other cool stuff too, and whenever you buy a book there, it smells really, really good. They say they don’t pump anything in, it’s just all the incense and stuff. Wow. It’s amazing. I love to come home and fan through all the books I just bought and take in the scent. Long story short, I got the birthday gift, and ended up spending $70 total. It’s nice to have a $40 gift card when you walk in places like that! I was grateful as today, I hit the jackpot on books! Last minute, my yoga teacher called. She was feeling icky and asked if I could sub for her. Of course, I wasn’t doing anything else this evening. I headed to the studio, in the rain. Had 3 regulars and one from out of town on business. Fun group, great little class. Glad she asked me to do it, I feel better from just setting foot in the studio. It has a way of doing that, and like it! When I got home, my husband and son had gone fishing. My daughter, was playing spy. She had a little suitcase loaded up with a notepad, some highlighters, a compass, a watch, 2 flashlights and anything that Nancy Drew might need. Just imagine, if all we needed was a spy kit and the Disney channel for total satisfaction. Oh, to be 10 years old again. Categories: Yoga | Tags: age, bookstore, class, drew, fishing, instruction, kit, nancy, new, spy, studio, sub, Yoga | Permalink.